September 4, 2013 - Kenneth Wallis who played as James Bond stunt pilot for Sean Connery in the movie “You Only Live Twice” died at the aged of 97. His eldest daughter, Vicky Wallis said "He had a great long and successful life. He died peacefully at 3 AM on Sunday and I was at his bedside. He led a wonderful life and I'm sure most of us could only hope to live for so long and to fill our time with so many experiences and achievements”. Wallis was born April 26, 1916 in Ely, England. Wallis began his long and distinguished aviation career in 1942, as a bomber pilot for the Royal Air Force (RAF) flying the Vickers Wellington, a British twin-engine, long range medium bomber. In 1956, part of an exchange program with the U.S. and the Uk Wallis was assigned to the U.S. Strategic Air Command in Italy were he flew the Convair B-36 "Peacemaker" a strategic bomber. The B-36 was the largest mass-produced piston engine aircraft ever made. The aircraft had six piston engines and four auxiliary jet engines. It had the longest wingspan of any combat aircraft ever built, 230 feet. 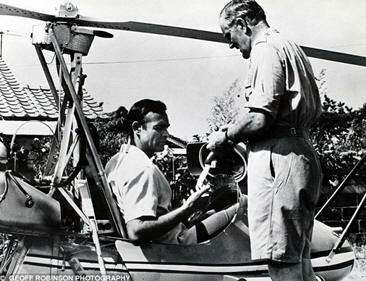 Wallis left the RAF in 1964, at which time he and his cousin Geoffrey started a company, Wallis Autogyros Limited. In which the company was involved in research and development and building Autogyros. An autogyro also known as gyroplane, gyrocopter, or rotaplane, is a type of rotorcraft which uses an unpowered rotor in autorotation to develop lift, and an engine-powered propeller, similar to that of a fixed-wing aircraft, to provide thrust. 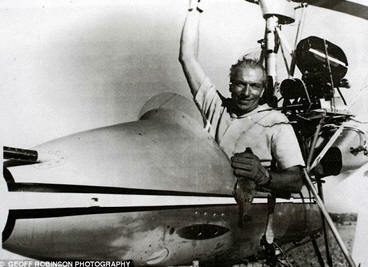 Between 1968 and 2002, Wallis set 17 World Records in two Classes of the autogyro, 34 in all. To date many of those records are still held by Wallis, including the speed record set in 2002, of 129 mph in a one piston engine autogyro in level flight over 1.9 miles. Wallis appeared in several films and a number of documentaries. However, the most famous was when he doubled as James Bond in "You Only Live Twice". Wallis flew his own autogyro design, WA-116s dubbed "Little Nellie" in the film in which he dramatically dispatched all the enemy helicopters sent up to intercept him by employing a vast range of authentic weaponry. The famous seven-minute scene, in which Bond is attacked by helicopter as he flies above a volcano in Japan, took 85 flights and 46 hours in the air to film.